The past few years have been kind to the Superbike class. Every manufacturer has rolled out fresh offerings that have pushed performance and technology to unprecedented levels. The current crop of liter bikes is chockfull of rider aids and technology that can make even the staunchest enthusiast’s head spin with an alphabet soup of acronyms. Most recently, it has all been kicked up a notch with the addition of electronically adjusted suspension. Yamaha, Honda, BMW, and Ducati all have premium Superbike offerings supported by semi-active electronic suspension. The 2018 Kawasaki Ninja ZX-10R SE has joined the party with Showa providing the flashy new componentry, a first for both Kawasaki and Showa. We haven’t laid our mitts on the all-new Honda CBR1000RR SP since Arthur Coldwells lapped Portimão, Portugal’s undulating Algarve International Circuit in 2017, so it was high time to get reacquainted with one of motorcycling’s most famous superbike lines. Keen-eyed riders will note that we have a 2017 Honda CBR1000RR SP in the story. As the motorcycle has not changed, save for a slight alteration of the livery, this model year, we will let the ’17 stand-in for the 2018 Honda CBR1000RR SP. On paper, these two Japanese inline-4 powered motorcycles have a lot in common. They have nearly identical specifications regarding their engines—bore, stroke, and compression ratio, for example. Each motorcycle has Bosch IMU supported safety packages, with lean-angle-detecting traction control, wheelie control, rear wheel lift mitigation, cornering ABS, and more. Both models feature semi-active suspension, and the similarities don’t stop there. But, as we’d soon find out, the riding experience of each bike is dramatically different. I packed up the truck and headed off to Buttonwillow Raceway Park and joined TrackDaz, a Southern California track day organization led by an exuberant group of fellows that have been letting speed junkies wring their bikes out on California’s circuits since the early 2000s. We’d need some help on this comparison test, so I tapped one of the fastest freelance motojournalists this side of the Mississippi—Michael Gilbert. Gilbert currently races in the MotoAmerica Superstock 600 Championship aboard his RiderzLaw Racing Yamaha YZF-R6. You’ll have two perspectives—the average paced enthusiast and that of a current professional racer. To eliminate tire performance variables, each motorcycle had a fresh set of Dunlop Q4 tires laced up to their forged aluminum alloy wheels. That would keep things easy, as we wouldn’t be using tire warmers—not that we’d need them in pleasant 100+ degree weather. In addition, TrakBrand was on hand to make our 2018 Kawasaki Ninja ZX-10R SE look even stealthier with some light covers. Sadly, we had to break out the ol’ blue painters tape for the 2018 Honda CBR1000RR SP, as TrakBrand was still developing that application during this test. We often apply much of a motorcycle’s personality to its engine, so that’s where we’ll start. The 2018 Kawasaki Ninja ZX-10R SE’s 998cc powerplant is nearly identical to the one found in the standard ZX-10R; the only difference is the lack of a reinforced crankcase on the standard model. Power output and behavior are equal between the two models. It has the classic inline-4 personality—rev hungry, making escalating power above 9000 rpm to about 12k. That hit of gleefully brutal top-end power is one of the more exciting aspects of the ZX-10R – when it happens, you know you’re in for a ride. The lack of low-end and subdued mid-range torque isn’t an issue, but it does beg the rider to keep the revs up to extract the most out of the powerplant. In slower corners, such as turn 2, first gear was more of a requirement than a suggestion. On the opposite end of the spectrum lies the 2018 Honda CBR1000RR SP’s motor, which seems to define the all-too-common description of ‘tractable power delivery.’ It doesn’t have the oomph and aggressive ‘slap you upside the helmet’ personality of the ZX-10R SE, but it makes up for it by having a perfectly smooth ride-by-wire throttle and power delivery, allowing riders to build up speed incrementally. The slight abrupt throttle response with the Kawasaki means that you’ll have to keep a steady hand when cracking the throttle during mid-corner and exit or when closing it to tighten a line. Of course, adjustable power and engine braking modes are available on each bike. However, there is a greater range of adjustment aboard the Honda. Both machines make use of quickshifter and auto-blip systems. In either case, whacking your way up through the gearbox down the straights, or grabbing a smooth full-throttle upshift through longer turns is always helpful. The Kawasaki can become slightly finicky on the downshift when wringing the engine out, as it has a shift limiter that’s more conservative than the Honda to prevent mechanical over-revving. Gilbert and I experienced a bit of hesitation from Kawasaki’s autoblip system in those few instances, but a solution was to either clutch through it or let the engine rpm settle slightly. The Honda didn’t give us any issues in that regard, and it was marginally smoother, up and down. The Kawasaki Ninja ZX-10R SE makes use of a 43mm Showa Balance Free Front Fork (BFF) and a linkage-assisted, horizontally mounted Balance Free Rear Cushion Light (BFRC Lite) shock—the very same hardware found on the flagship Ninja ZX-10RR. Spring-preload adjustment is dialed in manually, while all rebound and compression damping settings are controlled by the Kawasaki Electronic Control Suspension (KECS). The 2018 Kawasaki Ninja ZX-10R SE’s ECU and IMU monitor your vehicle speed, as well as the suspension stroke rate, to help the KECS system determine damping settings needed at any given moment. Forward pitch during deceleration is also factored in with this system, though not eliminated to allow for proper geometry. Unlike its competitors, including the Honda’s Öhlins suspension, Showa has used a solenoid valve control rather than stepper motors to rapidly adjust damping at a claimed rate of 1/1000th of a second. Kawasaki owners will find three KECS settings—Road, Track, and Manual. Road and Track are preset modes, while Manual allows riders to adjust compression and rebound damping from the dash, as they see fit, and it retains semi-active adjustment, unlike the Honda’s manual modes. If Road or Track doesn’t tickle your fancy, Manual will likely get a setting that works. The 2018 Honda CBR1000RR SP goes all-in with a race-spec 43mm Öhlins NIX 30 cartridge fork and TTX 36 shock. The Öhlins Smart EC system relies on stepper motors that, in theory, could be slower and less accurate than the Kawasaki’s solenoid-controlled system. In our experience, that aspect of adjustment was imperceptible. Just like the Kawasaki, a dedicated Suspension Control Unit (SCU) works in conjunction with the Honda’s IMU to determine damping settings. Once in the saddle of the CBR1000RR SP, you’ll discover three manual modes that turn the suspension into analog hardware with tool-free adjustment—the benefit of semi-active electronic suspension is lost. However, owners will be able to use three auto modes—A1 (Fast), A2 (Enjoy), and A3 (Safety). Additionally, there are two user profiles that will allow owners to create profiles based on their desires – allowing a variety of setting combinations. The Öhlins suspension can still be dialed in further when in the auto modes by going into sub-menus and utilizing the Objective Based Tuning interface. The interface breaks suspension tuning down by General, Braking, Acceleration, and Cornering, with +/- 5 levels for each parameter. For riders who don’t fully understand suspension dynamics, it’s a good solution to simplify things. For example, when riding, ask yourself, “Do I need a stiffer front end when braking?” If so, you dial up the braking support. In either case, each machine is equipped with an electronically controlled Öhlins steering damper. Based on engine performance alone, a clear division in philosophy begins to emerge between the bikes, with their handling abilities driving the point home. The ZX-10R SE is poised and stable virtually anywhere in a turn. In Track mode, damping is significantly stiffened, and the chassis feels taut as a result. Tipping the ZX-10R in isn’t something that will be met with resistance, but you do need to give it some input or direction. The Kawasaki SE’s wheelbase of 56.7 inches is a healthy 1.4 inches longer than the Honda SP’s, making it feel planted and continually confidence-inspiring. I noticed it most during hard acceleration. Interestingly, the electronic suspension keeps the chassis relatively neutral in those moments, ensuring good drive from corners. Feedback from the chassis is another highpoint, as the 2018 Kawasaki Ninja ZX-10R SE lets the rider know precisely what’s going on under them, with top marks going to front-end feel. Honda has taken its chassis in a different direction. Kawasaki may have sacrificed agility for stability, while the Honda’s greatest strengths lie in how quickly you can get to the edge of the tire and off it again. 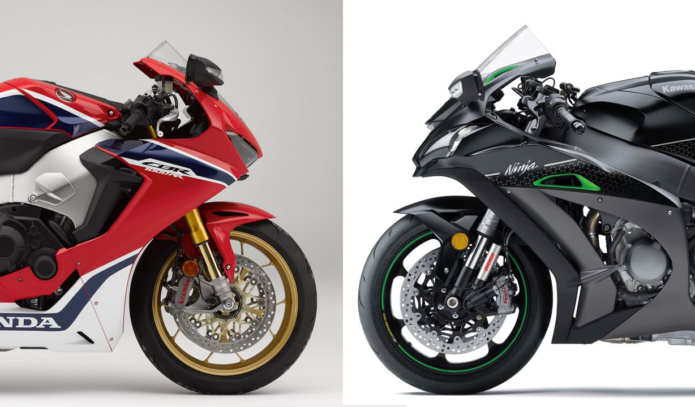 The CBR1000RR SP’s spec sheet supports that claim with a steep 23.3-degree rake, compared to the ZX-10R SE’s relaxed 25 degrees of rake. Running these machines through quick chicanes, their weight differences also become apparent. Flipping the CBR1000RR SP from right to left, its claimed 432 pounds can only be a massively positive attribute. The ZX-10R SE does tip the scales 27 pounds more at a stout 459 pounds, so it requires additional effort. Gilbert did also note a hint of wallowing during the mid-point of those quick transitions aboard the Honda. Running the Honda SP in A1 (Fast) mode, the suspension feels far plusher than the ZX-10R SE. Geometry changes were more readily felt, especially under heavy braking. The SP coaxes you to keep pushing into corners a bit faster, lap after lap, which makes it a more confidence inspiring bike in many ways, even while being less planted than the SE. Also, Gilbert felt that the ZX-10R SE’s electronic suspension would sometimes stiffen up when cornering, causing him to run wide. While not dangerous, it did impact his ability to hit his marks consistently on every lap. Despite using identical radially mounted Brembo M50 cast aluminum four-piston calipers up front, the braking systems tell a strangely different story regarding performance and feel. The green camp has opted for dual 330mm floating rotors, while the red camp makes use of slightly smaller 320mm full-floating rotors. On both bikes, a 220mm rear rotor is grasped by a single-piston Nissin caliper. The other difference is that Kawasaki use braided steel brake lines whereas Honda still opt for rubber brake lines. After barreling down the front straight, the CBR1000RR SP offers up an initial soft bite with a progressive feel at the lever, allowing riders to build up brake pressure comfortably. That’s in stark contrast to the ZX-10R SE, which has a much stronger initial bite. However, feel and feedback trails off when the Ninja’s lever gets pulled in farther. Braking power is more than adequate on the Kawasaki, but feel isn’t translated to the rider as effectively as it is on the Honda. With a few good laps under our belts aboard the Honda, it was tough to overlook the considerable rubber brake lines induced brake-fade once a decent amount of heat is generated. Charging into Turn 1 at Buttonwillow Raceway is particularly eye widening when the lever comes back to the handlebar. It is a behavior that Arthur Coldwells didn’t experience while attending the launch of the latest CBR1000RR SP at Algarve, which was held during a somewhat temperate time of the year. We could attribute the Honda’s front brake-fade to the rubber lines that expand when hot, and possibly the smaller rotors that don’t dissipate heat quite as quickly as the Kawasaki’s, when riding in scorching temperatures. Whatever the cause, it shouldn’t be happening on a bike of this stature and we didn’t experience it on the Kawasaki, which features almost the same hardware but with a couple of key differences. As these are flagship models, they’re loaded to the brim with IMU-supported electronics to keep riders fast, and safe. The SE’s five-level Sport-Kawasaki Traction Control (S-KTRC) system is arguably more relaxed in its intervention, with levels 1 and 2 being a good match for track riding. ABS and wheelie control are not independently adjustable, and their level of intervention depend on the S-KTRC setting. Depending on your level of aggression and comfort, Kawasaki’s level 1 will allow a controlled amount of sliding when putting power to the ground – with a nice ego bump to match. However, be warned, you can quickly send yourself to the moon if you’re overzealous with the throttle. The CBR1000RR SP electronics suite is equipped with Honda Selectable Torque Control (HSTC)—traction control that features 9-levels of adjustment. Wheelie control is tied to the traction control and is not independently adjustable. ABS intrusion is tied to the HSTC settings, as well. In level 1, the CBR1000RR SP was as close to unchained as Honda will allow you to get it without turning it off completely. In hard acceleration zones, the Honda is happy to slide the rear, though it wasn’t as predictable as the Kawasaki. In level 2, the Honda’s engine was reined in slightly, still allowing for a bit of hooliganism without overreaching. In level 3 and beyond, it hampers performance to a noticeable degree. The CBR1000RR’s 32.3-inch seat height offers up aggressive, yet comfortable accommodations in the saddle. With my 32-inch inseam, I didn’t feel any excessive knee-bend, and still had plenty of cornering clearance. Additionally, transitioning from side to side is more than amicable. Curiously, the ZX-10R could be described similarly yet with some deviations. The rider sits much higher on the Kawasaki’s chassis. It’s great for transitioning and climbing around the bike, which you’ll need to do as it does require a bit more input. Strangely, the Ninja boasts a slightly shorter seat height, although I would have guessed otherwise—you can’t judge everything by a spec sheet. Fit and finish is a highpoint on the 2018 Honda CBR1000RR. All the plastics mate perfectly, and the overall appearance is quite impressive. To finish it off, the full-color TFT display is entirely visible in direct sunlight. In 2016, when the Kawasaki Ninja ZX-10R was revised, its appearance didn’t get the same attention. The choice was made to push greater resources towards R&D, and Kawasaki’s dominance of the World Superbike Championship is a testament to the wisdom of that choice. For 2018, there are new mirrors and plastic, though the design closely mimics its predecessor. The basic LCD dash did make the cut for this generation of the bike. It would have been great to see the stellar TFT dash from the H2 SX line here. On a positive note, the rev counter is easily read in the periphery and on track; that’s about all you should ever need. These two machines seem to sum up choice when it comes to motorcycling—it is all about compromise. The 2018 Kawasaki Ninja ZX-10R SE has incredible top-end power, married to unfaltering stability. The Ninja rewards those who are willing to push it in and out of corners, though you will have to work for it when riding at a faster pace. The front-end feel needs to be commended once again; it delivers monastic levels of faith. It’s easy to see why the ZX-10R wins as much as it does. With the ZX-10R SE, Showa has shown it can provide a competitive semi-active electronic suspension package. Riders capable of pushing low lap times might find it unpredictable in certain circumstances, though I was quite happy with its performance as a non-professional racer. The electronics suite seems to be more agreeable to competitive riders such as Michael Gilbert, who benefit from rider aids that help extract that last bit of performance, without being overly intrusive. The 2018 Kawasaki Ninja ZX-10R SE is much closer to offering that than its fellow Japanese competitor. In the superbike world, that’s about the highest praise consumer electronics can get. At the opposite end of the superbike spectrum is the 2018 Honda CBR1000RR SP. Its proven Öhlins semi-active suspension offers up a slightly more user-friendly experience, thanks to the Objective Based Tuning interface. The interface helps alleviate the fear and stigma that surrounds suspension tuning, allowing less-experienced riders to explore the possibilities of set up. Coupled with that is a chassis that exemplifies what Honda is good at—confidence inspiring, agile, and easy to ride. The 2018 Honda CBR1000RR SP is an everyman’s superbike—both a strength and a weakness. Sure, its engine doesn’t have the same thrilling personality as the Kawasaki, but that’s something quickly forgotten once the lap times start dropping. Together, these machines illustrate two radically different thought processes of bike development. Honda takes a more user-friendly approach to its Superbike, making the 2018 CBR1000RR SP something that riders of any skill level can throw a leg over and gain confidence with quickly. Kawasaki hasn’t hidden the edgy aspect of its motorcycle. In fact, they’re a highlight and in the right hands the 2018 Ninja ZX-10R SE can be taken to a WSBK championship or three.